A photocell switch is essentially a light dependent resistor, LDR. Its resistance decreases with increasing incident light intensity. They are used in many applications for on-off control especially in lighting installations. In lighting applications, Photocells are placed in streetlights to control when the lights are ON or OFF. During daylight, light falling on the photocell causes the streetlights to turn off and during night hours or darkness to turn on. Thus energy is saved by ensuring the lights are only on during hours of darkness. In most photocells, the load line wire is RED, the neutral wire is WHITE and the Supply line is black. This colour code is not universal. 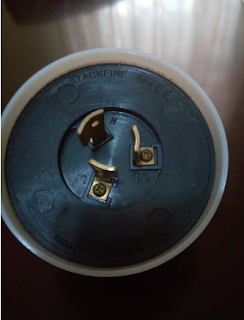 It may change for some other brand of photocell. 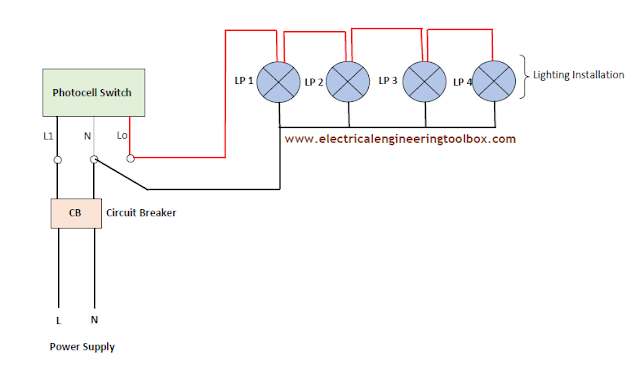 As shown above, the load wire (Lo) goes to the lighting installations connected in series while the neutral (N) wire through a breaker is looped to all the lights. The supply line through a breaker supplies the photocell electrical power.